Sitting on top of bedrock of solid limestone, the city of Sandusky has the largest number of limestone buildings in Ohio. One such building is the Follett House, a Greek Revival mansion that was once home to prominent publisher Oran Follett. 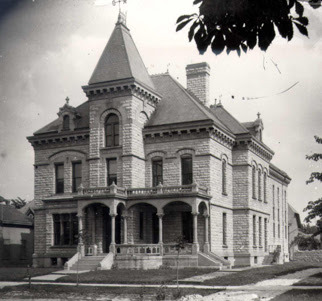 The Follett House was built with stone quarried from a lot across the street, between Adams Street and Huron Avenue. With a ready supply of limestone, quarrying became an early industry in Sandusky. 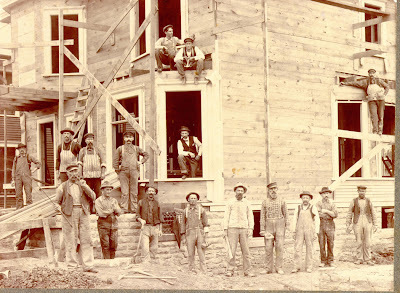 Many German and Irish immigrants were stone cutters, and they found work building homes, schools, churches, and businesses in Sandusky. 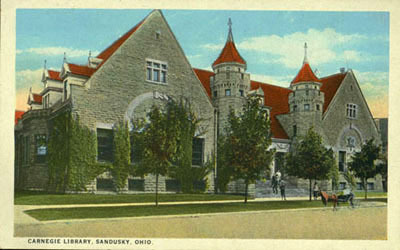 Helen Hansen noted in her 1975 book, AT HOME IN EARLY SANDUSKY, that “the name of Feick has been associated with building in Sandusky for over 100 years.” The Erie County Jail (pictured above), now part of the Sandusky Library, was constructed by Philip, Adam, and George Feick in 1883. 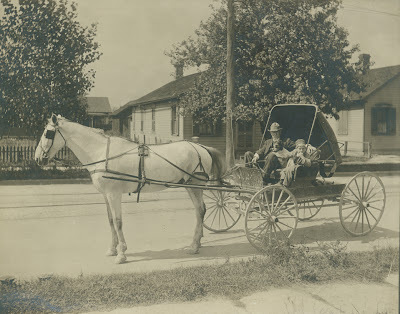 You can read about the Feick family in the book BUILDING AMERICA: A HISTORY OF THE FAMILY FEICK, located in the Family History collection of the Sandusky Library. The original Third National Bank of Sandusky was built in 1914 on West Market Street. Henry Millott was the architect, and the contractors were "G. Wm. Doerzbach and Brother." G. William Doerzbach is pictured below. For more information about the architects, builders, and contractors of Sandusky, visit the Archives Research Center of the Sandusky Library. Among the sources available on this topic is an excellent architectural history of Sandusky entitled TREASURE BY THE BAY, by Ellie Damm. That jail is a gem. Has it been changed much? Yes, it is a nice building. The exterior is nearly unchanged from how you see it in the picture, except that a set of porch stairs was removed years ago, some of the porch trim has been removed, and the roofing shingles are different. The interior was completely redone when the building became part of the new expanded library about five years ago. I added a thumbnail image of the present building to the main page of the blog, if you're curious to see how it looks today. For some reason I want to say the unidentified house is the one west of Crdinal's parking lot.